While it gets cold in the rest of the world, BBQ season starts in Dubai. While most people living in the northern hemisphere are cuddling up at home with a warming cup of tea, we are seeding herbs and veggies in our garden. The summer in Dubai is long and hot, but so are the winters in Northern parts of Europe and America. We were invited to a BBQ recently, and a cheese quick bread was on the table as an appetizer while the main course was grilling on the BBQ. I never had anything like that before, especially not in the form of quick bread. As I like to cook and bake with whole wheat flour (which is an arch enemy of yeast), I was intrigued. Just a few days later I made this olive cheese bread with homegrown chives. A perfect appetizer bread, good enough to have with just a little butter or some dip. I can also highly recommend this bread as a supplement for mild creamy soups. We had it with some creamy leek soup the other night. The cheesy bread worked really well with the mild taste of the leek. This bread will also be a good thing to bring for potluck, picnics, or any sort of no-fuss gatherings. And even if there is no crowd to entertain, it serves perfectly as a snack in between meals. Keep it tightly wrapped in the fridge and it will keep fresh for 2-3 days. I'll make this bread again and again again. In a large bowl sift together flour, baking powder, baking soda, salt, pepper, and mustard powder. 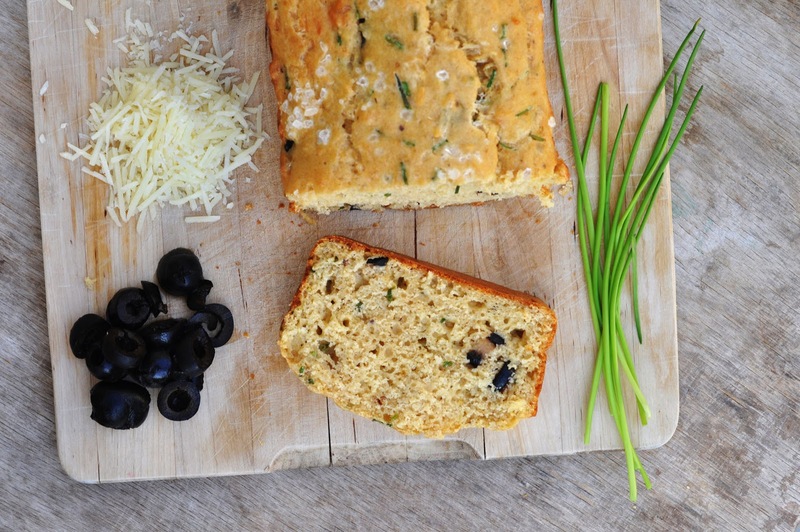 Stir in Parmesan and Gouda cheese, the olives and the chives. In a small bowl, lightly beat the eggs. Whisk in olive oil and buttermilk. Combine wet and dry ingredients. Pour the batter in the prepared loaf tin. Sprinkle with rock salt. Bake for 45 minutes or until toothpick comes out clean.